Hurrah, it’s finally asparagus season! Asparagus is such a delicious summery vegetable, I thought I would pick some up to have for dinner one night this week. I try and keep weeknight meals as simple as possible, as I’m usually hungry and tired when I get home from work and want something easy to whip up. I’ve slipped into a habit recently of only cooking vegetarian dishes for myself as meat takes too long. However, I came across some cod fillets in the supermarket, and thought that I would make a concerted effort to eat more fish this month! 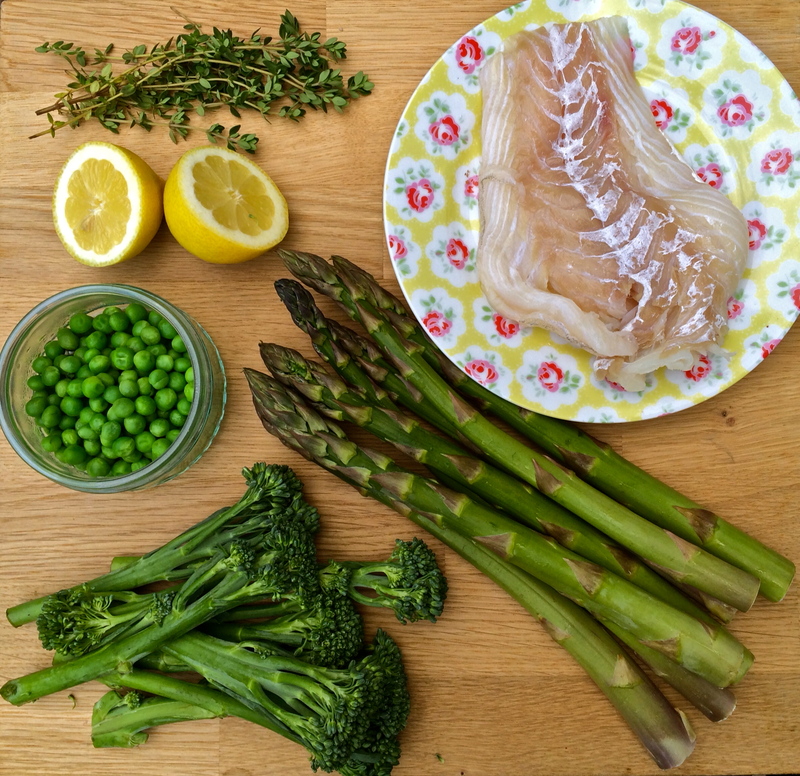 Luckily, asparagus and cod are a match made in heaven, and with a few simple ingredients can make the most tasty and simple supper. 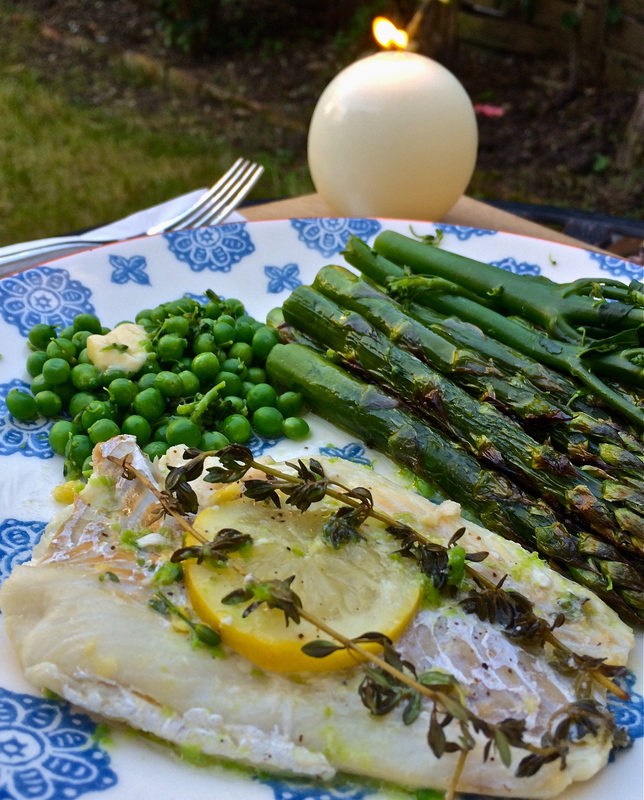 I chose peas, tender stem broccoli and asparagus to go with the fish, and lemon and thyme to flavour it. First prepare the fish by giving it a wash and popping it on a sheet of tin foil. Season it with salt & pepper, squeeze over the juice of half a lemon and grate over it’s zest, before popping a slice of lemon and a few sprigs of thyme on top. I used lemon thyme which was beautifully fragrant, but you can use pretty much any herb you like. Add a knob of butter, scrunch the tin foil together at the top to make a parcel, and pop it in the oven at 180 degrees for about 10-15 minutes. Whilst the fish is in the oven, steam the broccoli in a pan until tender, adding the peas in for the final few minutes to warm through. I prefer my asparagus grilled as I think it keeps the flavour better, but you can steam this too if you like. Lay the asparagus on a tray, drizzle with olive oil and pop under the medium grill for about 8-10 minutes, turning them over half way through. Drain the vegetables and pop them on the plate. 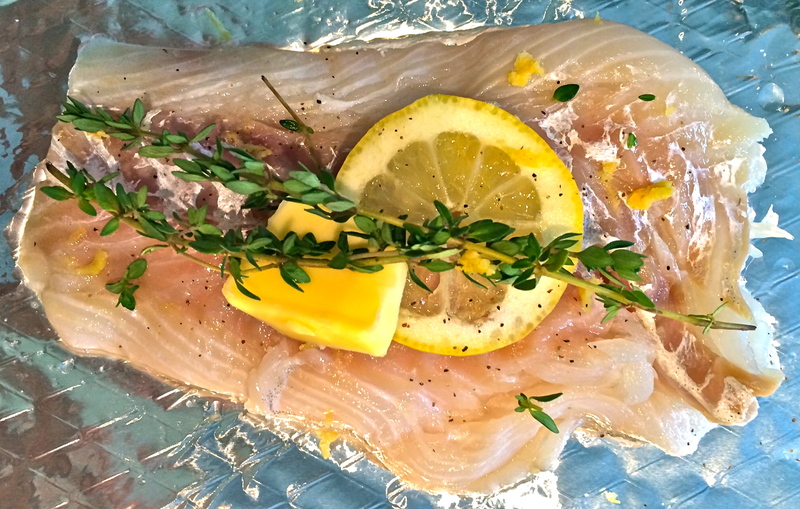 Lift the fish out of the foil and place it carefully next to the veg, drizzling over all the lovely lemony juices that are left in the foil. Et voila! A delicious, seasonal meal that is done in less than 15 minutes.